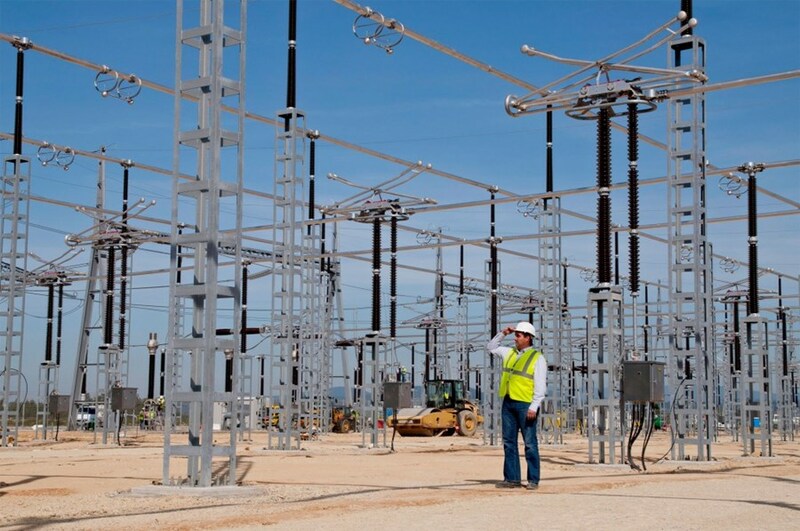 Carried by a double 400kV power line, an intense electrical current will run through the RTE switchyard that is situated on the southwest end of the platform. 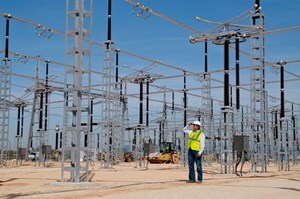 Under nominal operating conditions, power will pass through a complex array of conductors, busbars, switches, pantographs and circuit breakers to be dispatched to a set of seven transformers; the transformers in turn will convert the power to a lower voltage and distribute it to the ITER scientific installations. But conditions are not always nominal. "Things can happen," says Joël Hourtoule, section leader for ITER's Steady State Electrical Network Section. "Someone can make a mistake, an insulator might break ... and of course one never knows when and where lightning might strike." Such incidents could cause what is known as a "phase-to-ground" fault: instead of being channelled into the transformers, the current could short-circuit with the ground and reach an intensity some one thousand times higher than its nominal value (the value consumed under normal circumstances by the ITER plant systems). "For a very short moment until the circuit breakers operate," explains Joël, "we might have a current of more than 10 kA locally." This so-called "short-circuit current" could be damaging for the installation and dangerous for someone standing in and around the switchyard. 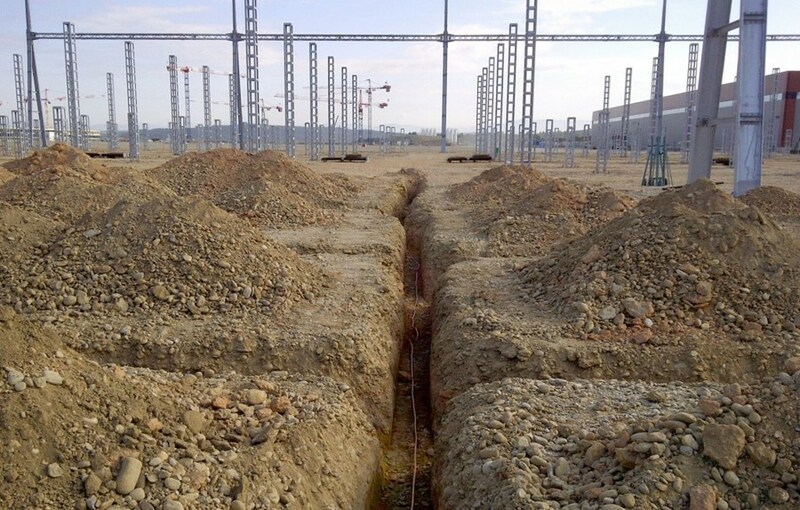 In order to decrease resistivity, the RTE switchyard is equipped with an ''earth mat,'' which consists of a network of rods and copper cables buried some 50 cm underground. A similar system will be installed on the platform. In order to prevent the consequences of a phase-to-ground fault, switchyards are equipped with an "earth mat," which consists of a network of rods and copper cables buried some 50 cm underground. This conductive network will decrease the overall area resistivity and ensure that, in case of fault, all the different metallic structures present a homogenous electric potential (termed "equipotentiality"). RTE installed such an earth mat in the switchyard enclosure. However, according to codes and standards and the best industrial practice, it is important for ITER to know how far onto the platform, and with what intensity, the rise in earth potential would extend in case of a phase-to-ground fault. Two weeks ago, in order to measure the effects of a phase-to-ground fault, a generator placed in the RTE enclosure was used to "inject" current pulses into the ground. Teams were dispatched to several locations on the ITER site to measure what is called the step voltage—the voltage that would pass through (and possibly hurt) a standing person. The RTE teams spent about two days performing measurements, not only on the ITER platform but also far into the nearby forest. "At a distance of 800 metres from the impact point, the earth potential, although already very feeble, was still measurable," says Joël. Measurements were also performed outside the ITER perimeter (almost two kilometres beyond the fence into the forest) in order to get a clear overall picture. Measurements indicate that personnel operating outside the RTE switchyard will not be affected by a potential phase-to-ground fault. However, small potential differences can still induce perturbations in the control command signals of the installation's plant systems or in the electrical distribution networks. 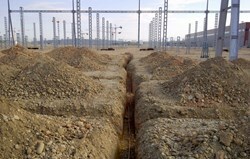 Consequently every building on the ITER platform will be surrounded with an "earth loop" buried some 50 cm underground. Once interconnected, the loops will form a network of several tens of kilometres of copper cable—an earth mat covering the 42-hectare of the platform.